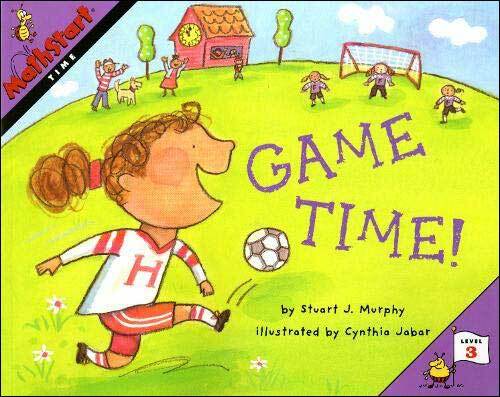 This Math Start series book uses a championship soccer game to teach about weeks and days (the time building up to the game), and hours and quarter hours (practicing just before the game and then the ever-present scoreboard's countdown/clock.) This book is part of the MathStart series. This book was named an ALA Booklist "Top 10 First Novels"! The emphasis is definitely on hours and telling time, but integrating days and weeks into the story also helps provide the larger context for time. Time is seamlessly integrated into the storyline as well as shown in the adorable illustrations and in the speech bubbles of the characters. And considering the popularity of soccer, this book is an appealing choice for lots of reasons. Below are sample spreads from inside Game Time. We love the adorable illustrations and the fact that the author and illustrator have worked clock time, days, weeks, and months into the storyline. Circle a student's birthday on a calendar, then ask how many months until this date? How many weeks? How many days? Do several students' birthdays as well as holidays or other noteworthy days. You can also ask how many weeks between birthdays or special days. Before doing a regular classroom activity (ie: cleaning out desks), pick students to predict how long the activity will take. For tasks that take less than a minute (ie: lining up for lunch recess), predict the duration in seconds. Time the task, then check to see how close the estimate was".